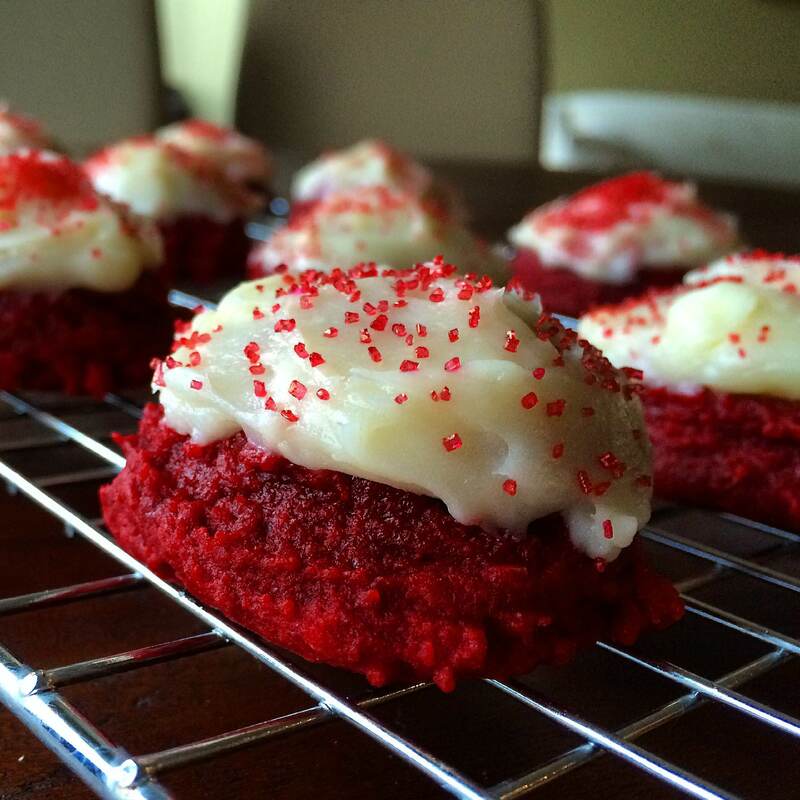 The glory of red velvet cake with the portable capabilities of a cookie. My cravings for red velvet cake are pretty intense. My birthday is the day before Valentine’s Day so red velvet cake has been a part of my life for a very long time. As January finished up I realized I needed RVC in my life sooner rather than later. I felt weird, however; having an entire cake hanging out in my one bedroom apartment. 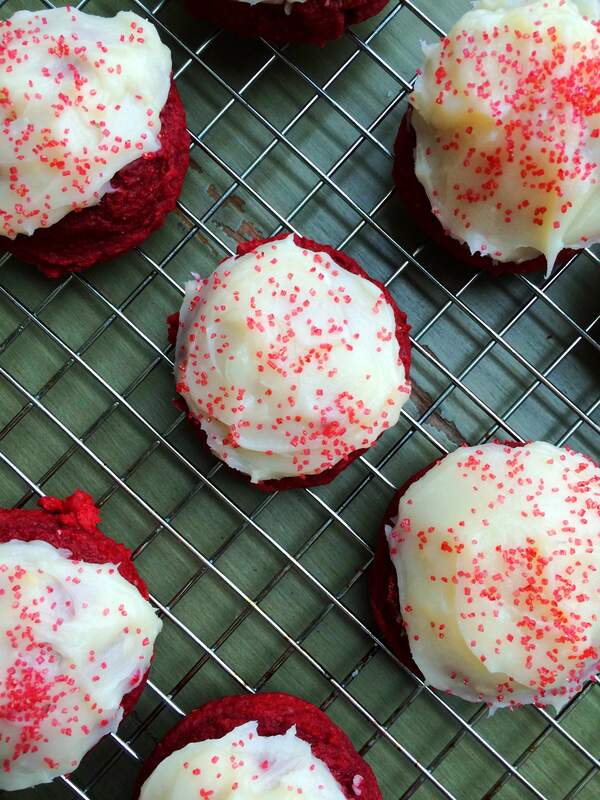 Enter: red velvet cake cookies. These have the texture of cake, the frosting of cake… it almost feels wrong to call them a cookie. It does not feel wrong, however, to eat 2-3 of them in one sitting. *You can mess with the ratio here. I would probably do a little less butter and a little more cream cheese next time. Also- try to be more ladylike with your frosting application than I was. Cream together butter, vanilla and sugar in a medium bowl until fluffy. 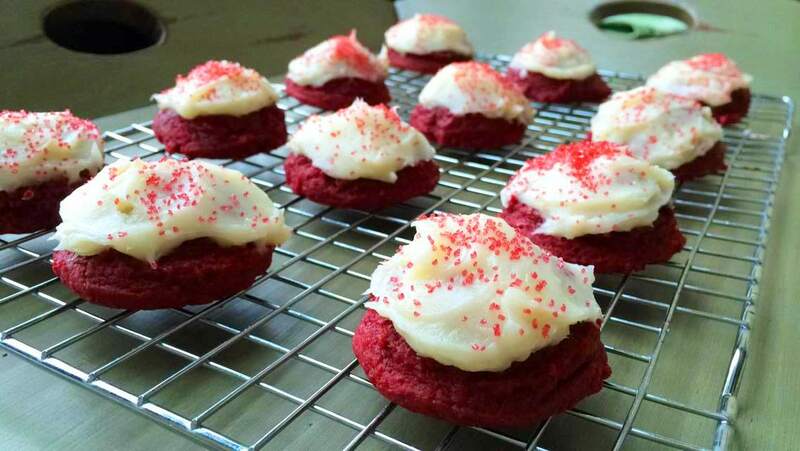 Stir in eggs, sour cream, cocoa and red food coloring until evenly combined. Stir in flour and baking powder. Drop heaped tablespoons onto a parchment lined baking sheet. Bake for 8 minutes at 350 degrees F then transfer to wire rack to cool. Mix together all the frosting ingredients. Swirl the frosting on top of the cooled cake cookies and devour.